The Alignment Collaborative for Education conducted its second update to School Board U-46 on March 19, 2018, highlighting progress on its 2018 Operational Plan along with updates from the three A-Teams: Educational Pathways, Early Education and Trauma Informed Care. Peter Sikorski, Get Fresh Produce, and Bill Wright, The Overture Group, also provided updates from the Governing Board on new initiatives to include industry roundtables, implementation of a work-based learning survey with area companies as part of a partnership with the Elgin Area Chamber of Commerce and the National Campaign for Grade Level Reading initiative complimenting Alignment’s work in early education. The Alignment Collaborative for Education (ACE) is joined by 11 community partners that represent organizations within Elgin, Illinois and the greater School District U-46 community. These 12 partners represent organizations within the community that either have experience with leading collective impact initiatives and/or represent the strongest early-education subject-area expertise within the region. Joining the NCGLR allows the 12 community partners to align around a shared Community Action Plan that addresses early education preparedness as early as birth to age 8. Each partner brings diverse expertise to the initiative varying from a before school age concentration to experience in the completion of elementary school and middle school preparation. Over 70 manufacturers, community leaders and School District U-46 staff participated in Alignment’s first roundtable on March 14, 2018, at the Hoosier Grove Barn in Streamwood. The purpose of the roundtable was to discuss work-based learning as a priority for manufacturing workforce recruitment. LaSalle Crosby, Corporate Recruiter, John B. Sanfilippo & Son, Inc. Sponsor EXPO 2018: Become a sponsor of EXPO 2018 to make hands-on career exploration a possibility for all eighth grade students in U-46. ACE is working towards improvements in outcomes for all U-46 students. 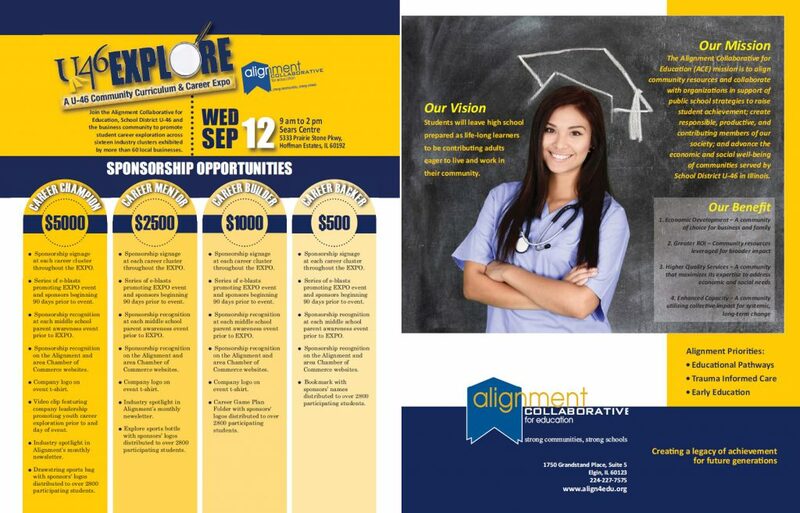 ACE is a member of the Alignment USA communities of collaboration and collective impact.